Read Rafe Esquith's posts on the Penguin Blog. 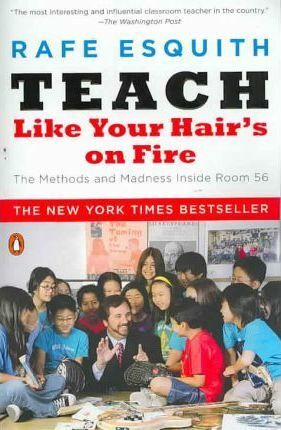 The New York Times bestseller that is revolutionizing the way Americans educate their kids-"Rafe Esquith is a genius and a saint" (The New York Times) Perhaps the most famous fifth-grade teacher in America, Rafe Esquith has won numerous awards and even honorary citizenship in the British Empire for his outstandingly successful methods. In his Los Angeles public school classroom, he helps impoverished immigrant children understand Shakespeare, play Vivaldi, and become happy, self-confident people. This bestseller gives any teacher or parent all the techniques, exercises, and innovations that have made its author an educational icon, from personal codes of behavior to tips on tackling literature and algebra. The result is a powerful book for anyone concerned about the future of our children. Sixteen: Do They Know It's Christmas? "Esquith is a modern-day Thoreau, preaching the value of good work, honest self- reflection, and the courage to go one's own way." "Politicians, burbling over how to educate the underclass, would do well to stop by Rafe Esquith's fifth-grade class." "The most interesting and influential classroom teacher in the country." -Newsday "Politicians, burbling over how to educate the underclass, would do well to stop by Rafe Esquith's fifth-grade class." -Time "The most interesting and influential classroom teacher in the country." Rafe Esquith has taught at Hobart Elementary School for twenty-two years. He is the only teacher in history to receive the National Medal of Arts. He has also been made a Member of the British Empire by Queen Elizabeth. His many other honors include the American Teacher Award, Parents magazine's As You Grow Award, Oprah Winfrey's Use Your Life Award, and the Compassion in Action Award from the Dalai Lama. He lives in Los Angeles with his wife, Barbara Tong. Read CBS's news story on Rafe Esquith.